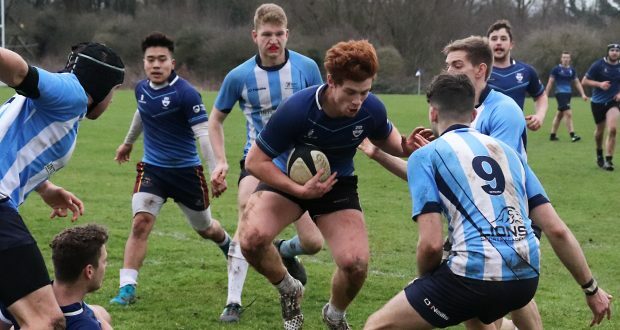 Kingston University men’s rugby team fought to the last second to beat St Mary’s third team 24-17 in a thrilling match at Tolworth on Wednesday. Hamish Burdge, the club president, told the team they had made a “herculean effort” to hold off a St Mary’s side that scored two tries in the second half. Burdge and Alex ‘Goode’ Price scored KU’s four tries in a game that was hard fought by both sides, with a strong defensive display from the two teams. “I think it’s big that we can finally now start playing as a team, together, and really listen to each other and not do what we’re good at individually, but what we’re good at as a team,” Adam Nilsson, the team captain, highlighted after the match. In the first 20 minutes of the match both teams held each other off, until Hamish Burdge scored KU’s first try in the 26th minute after building up pressure to break St Mary’s defence. Price continued KU’s successful run scoring two tries in the first half and George Denham scoring conversion kicks. Price’s second try was described as a moment of genius by his team mates when he faked a penalty kick and ran from the half way line to score a try, and Denham’s conversion meant that KU went into the second half winning 19-0. “In the second half we lost it a little bit but I think it showed a lot of character to be able to hold it together,” Nilsson said. Chris Painter, the team’s ex-captain, said the team’s six injuries were taking a toll on its abilities to do line-out plays, however the KU side proved to adapt to this during the match. The second half started with an injury on the St Mary’s side followed by their first try and conversion kick scored shortly after, on the 47th minute. KU player Flynn Smeeton had to be taken to A&E on the 50th minute after a tackle left him with a dislocated or broken wrist, according to the medic at the scene. St Mary’s scored two tries in the twenty minutes after Smeeton’s injury, and tensions ran high in the last minutes of the game. Price scored KU’s fourth try which guaranteed the Cougar’s win on final minutes of the match, although St Mary’s kept pressure until the whistle blew to end the game. “I feel very tired, but I’m very happy because it’s my first hat-trick as a player,” Price said. “I’m proud of the team, we did well, and at the end we just came together. We got a bit complacent, there was a few mishaps, but in the end we turned it around,” he added. This KU win means that the team are through to play the semi final of the South Eastern Conference plate cup. The Cougars’ next match will be away, on February 13, against the University of Chichester’s second men’s team.